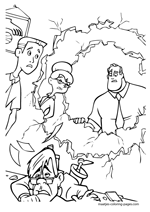 In The Incredibles "Supers"�humans gifted with superpowers�were once seen as heroes, but collateral damage from their various good deeds led the government to create a "Supers Relocation Program", forcing the Supers to fit in among the civilians and not use their superpowers. 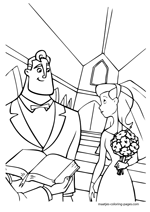 Bob and Helen Parr, who are Supers, have married and now have three children, Violet, Dash, and Jack-Jack in the suburbs of Metroville. 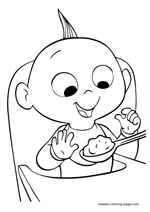 Violet and Dash have innate superpowers, but the toddler Jack-Jack has yet to show any. Bob, stuck in a white-collar job at an insurance agency, reminisces of his former days as Mr. 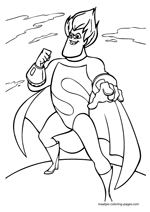 Incredible, and sneaks out on Wednesday nights with his Super friend, Lucius Best (a.k.a. Frozone) to fight street crime. One day, Bob loses his temper with his boss who refuses to let Bob help a mugging victim just outside the building, which results in Bob revealing his super strength and losing his job. While trying to figure out what to tell Helen, he finds a message from a woman named "Mirage", who asks for Mr. 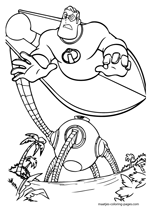 Incredible's help to stop a rogue robot on a distant island for a lucrative reward. Bob, claiming to Helen that he is going on a business trip, takes up Mirage's offer, and successfully defeats the powerful Omnidroid (v x8). On his return to Metroville, Bob spends his days working out and getting back into shape. He takes his super suit, torn in the battle with the Omnidroid, to Edna Mode, the fashion designer to the Supers, and asks her to repair it. She does so, and also insists on creating a new, better super suit for him. She refuses his request to add a cape, though, highlighting how this accessory has doomed several other Supers before him by getting caught on things. Mirage soon contacts Bob with another job on the same island. On arriving, he finds the Omnidroid (v x9), rebuilt and reprogrammed to be stronger than before. While trapped by the robot, he meets its creator, the technology-savvy villain Syndrome. 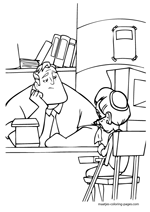 Bob recognizes him as a young fan, Buddy Pine, who as a teenager wanted to be Mr. 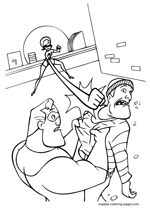 Incredible's sidekick IncrediBoy but was turned down, due to Bob preferring to work alone 15 years ago. Syndrome has vowed revenge for this shunning, and sets the Omnidroid to kill Bob. Bob fakes his death and hides from the robot, discovering the body of a former Super, Gazerbeam. His curiosity piqued, he breaks into Syndrome's base and finds a computer, which outlines Syndrome's obsessive work in tracking down former Supers to lure them into fighting the Omnidroid, and using the results of those fatal battles to improve each incarnation of the machine. Bob is relieved to discover that Helen and his children are not yet identified in Syndrome's database, and learns that a final design of the Omnidroid (v x10) will be launched toward Metroville, seemingly to destroy it. Meanwhile, Helen has become suspicious of Bob having an affair. After discovering Bob's repaired super-suit, she talks to Edna and learns she created new suits for the entire Parr family, each outfitted with a tracking device. Helen triggers Bob's, identifying the remote island but inadvertently revealing Bob's presence to Syndrome's headquarters and causing him to be captured. Helen borrows a private jet from an old friend and travels to the island. 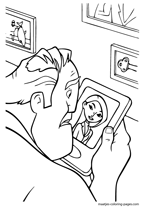 Midway she learns that Violet and Dash have stowed away while leaving Jack-Jack at home with a babysitter. 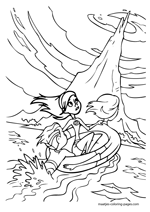 As they near the island, Syndrome shoots down the jet, but Helen and the children safely make it ashore. Though Helen rescues Bob and regroups with Violet and Dash as they outrun Syndrome's guards, they are soon captured by Syndrome, who identifies all of them as a family of Supers. With the Parrs contained, Syndrome explains that he will launch the newly perfected Omnidroid to Metroville, sending the city into chaos, upon which he will appear and, using a control band, "subdue" the robot and become the city's hero. Syndrome launches the Omnidroid on a rocket and follows in his aircraft. After his departure, Violet escapes and helps to free the rest of the family, and with Mirage's help, they board a second rocket bound for the city. In Metroville, the Omnidroid starts a path of destruction, and Syndrome enacts his plan, stopping the robot resulting in the people's cheers. 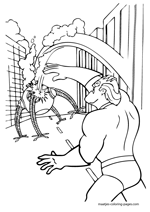 The Omnidroid observes the remote-control band and fires it off Syndrome's arm, sending the villain scurrying away while the robot continues to wreck the city. The combined abilities of the Parrs and Lucius are able to best and destroy the robot, and the city welcomes them back as heroes. As they are driven back to their home, Helen anxiously calls the babysitter and learns that Syndrome has abducted Jack-Jack. When they arrive at home, Syndrome is taking the toddler to his jet, planning to raise the boy to fight against the Supers in the future. As Bob and Helen launch a rescue attempt, Jack-Jack reveals his powers of transformation and fire-creation, forcing Syndrome to drop him into Helen's waiting arms. 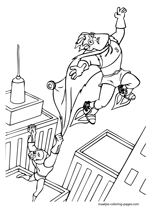 Syndrome tries to escape, but due to Bob's intervening, his cape is caught in the suction of his aircraft's engine, which kills him. The ruined plane crashes into the Parrs' home, but Violet is able to protect the family from harm. Three months later, the Parrs have re-adjusted to normal life, but when a new villain, the Underminer, appears, the Parrs put on their masks, ready to battle the new foe.